The use of avalanche transceiver, probe and shovel. AT (Alpine Touring) or spiltboarding gear . These day tours are follow up application tours to do after our Intro to Backcountry Skiing or for anyone with previous backcountry experience who want to go on a great "Sunday Tour". It provides more application of skills with refinement through tips and coaching. We keep a more consistent pace and climb higher and farther with more ski descents than our "Intro" day. These tours provide continuing education of avalanche safety skills. We make continued assessments, gather and record information of snowpack and avalanche conditions. This course can be taken the day after your Intro day to form a 2-day course. After meeting at The Back Country to gear-up, we will carpool to the Silver Creek Trailhead (near Squaw Valley) and begin a super fun day tour up this amazing terrain to the top of Silver Peak. From Mt. Lincoln at Sugar Bowl, we'll begin our route along Anderson Ridge and link up the best descents with pleasant skinups back to the ridgeline. 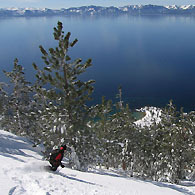 From the SnoPark near Boreal, we'll begin this classic tour to Castle Peak Summit and choose the best skiing projects enroute.